We still get doses of Priyanka Chopra and Nick Jonas December wedding through the pictures that keep flooding our social media handles. We still get doses of Priyanka Chopra and Nick Jonas December wedding through the pictures that keep flooding our social media handles. The recent photographs of the wedding of the year are giving us a closer sneak peek of the event. Priyanka’s friend and popular YouTuber Lilly Singh aka Superwoman recently unveiled a few photographs from the haldi ceremony of the celebrity couple. Going by the pictures, the American singer definitely got a taste of a ‘desi’ wedding. According to Lilly’s Instagram post, the Quantico actress told her to have “no mercy” on Nick during the haldi ceremony, and that’s exactly what the YouTuber did. “How to turn a Jonas brother into a Simpson. If I’m gonna do it, I’m gonna do it right! 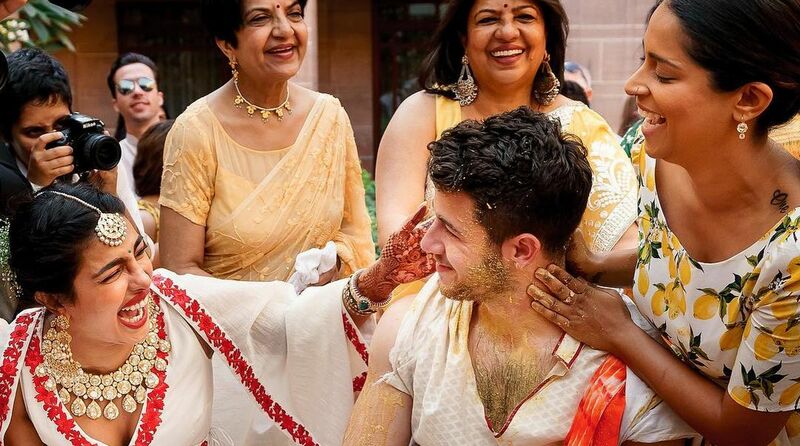 My sis @priyankachopra told me no mercy during the haldi (turmeric) ceremony on @nickjonas. Ya girl had to deliver,” Lilly captioned her post. Nick Jonas and Priyanka Chopra said their vows in two fairytale weddings — one Indian and one western — at Umaid Bhawan in Jodhpur. On the work front, Priyanka will be next seen in a Hollywood romantic comedy, Isn’t it Romantic?, which is being directed by Todd-Strauss-Schulson. The film is scheduled to release on 13 February 2019 in the US. Back home, she will also star alongside Farhan Akhtar in The Sky is Pink, which will be helmed by Shonali Bose.